“I know it,” said Philip. Philip is a very unique work in the Westlake canon. His one and only children’s book. His only book attributed to ‘D.E. Westlake’, which I don’t think was meant to obscure his identity, so maybe he just wanted to see how that would look on a book cover. His only book that was written specifically to be illustrated (nothing against Darwyn Cooke, but it’s a fact). The only book he wrote that was, far as I can tell, sold directly to libraries, and not in bookstores, making it by far the rarest and most expensive to collect of all his first editions (and to date, there have been no further editions). What is the reason for this anomalous item in his bibliography? What motivated him to write it? Though there’s potentially a good living in children’s books, he must have known going in he was going to make very little from this one. Ah, guilt. The ultimate motivator. But was this book really written for them? Is it, in fact, a children’s book? Yes, The Westlake Review’s well-established tradition of asking odd questions with seemingly obvious answers continues apace. I love children’s books–the good ones. There are innumerable bad ones, but of course Sturgeon’s Law holds true for all genres of literature. Probably no better reason to raise a family or have younger siblings than to get to read Dr. Seuss or The Wind in the Willows to them. My younger siblings used to run when they saw me coming with a book in hand, but I always caught them in the end. R.H.I.P. 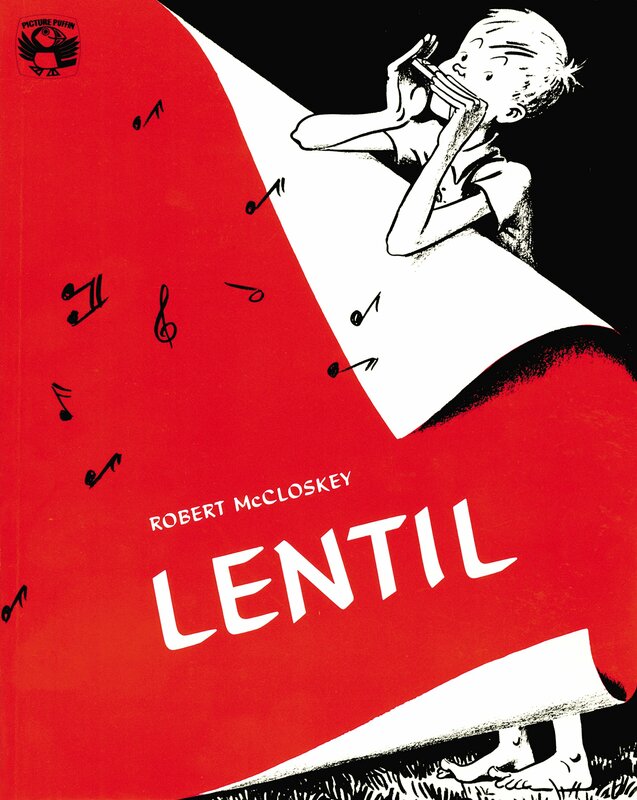 That other cover up above is, of course, Robert McCloskey’s Lentil, first published in 1940, when McCloskey was only twenty-six. My earliest memories of this book are of Bob “Captain Kangaroo” Keeshan reading it to me through the TV set. It’s a spellbinding tale of a young boy with a harmonica and his faithful dog foiling a grouchy old villain who is ruining the big town parade by sucking on a lemon. It makes perfect sense when you read it in the right mindset. Given his 1933 birth date, there’s a very good chance Westlake read Lentil when he was a kid. 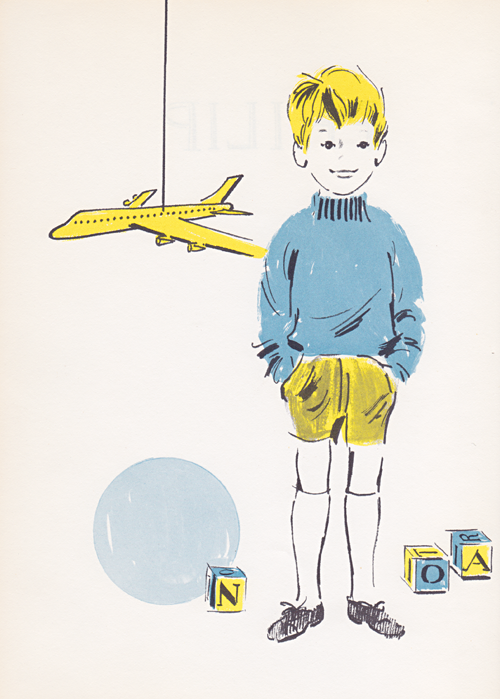 You’ll note some visual similarities, though of course the book’s artwork and visual design are properly credited to Arnold Dobrin, a very fine artist in his own right, if not in McCloskey’s league–not that Westlake was in McCloskey’s league as a writer of children’s books, either. Westlake was lucky to get somebody this good, and the simple color scheme, heavily centered around two or three primary hues, was typical of children’s books in this general time period, when the influence of McCloskey (and Seuss) was overwhelming. Though really, they still loom pretty large–there are no statues of Parker or Dortmunder anywhere, that I know of. Maybe they were stolen? Philip (no last name given or needed) lives in a huge apartment house, “taller than a spaceship and wider than a movie theater,” in a prosperous neighborhood in a large city that is not named but we all know it’s New York. The apartment is a spacious two-bedroom affair with a terrace. He lives there with his mother and father, but we never see the father, an absent figure in the story (hmm). We never see any other children, either. Philip has no siblings–like Westlake himself, I believe–no pets, seemingly no friends his own age in the building, but he is a happy calm self-possessed boy, who is enjoying his life, and mainly appreciates the interesting environment he’s growing up in, and the distinct pleasures of being an only child in a well-off family–most unlike the family Westlake himself grew up in. One of those pleasures is that your well-off parents will have well-off friends who give you stuff for no reason. One day, the doorman Mr. Neep, ‘the biggest and shiniest doorman on the whole block,” rings up to say there’s a package for Philip. It’s from Philip’s ‘Uncle Fred’, who is not actually an uncle, but went to college with Philip’s dad, and no I don’t know if his last name is Fitch, but I bet Westlake did. The package contains the sort of gift any boy Philip’s age would be overjoyed to get–a big beautiful yellow toy dump truck, that actually works, and runs on batteries. The kind of toy us middle class kids in the New York City area used to gaze at all googly-eyed when our parents took us to FAO Schwarz around the holidays, and then incessantly nag our parents to get us. God, we were brats. But seriously, parentals, why dangle the bait if you don’t want your kids to lunge at it? 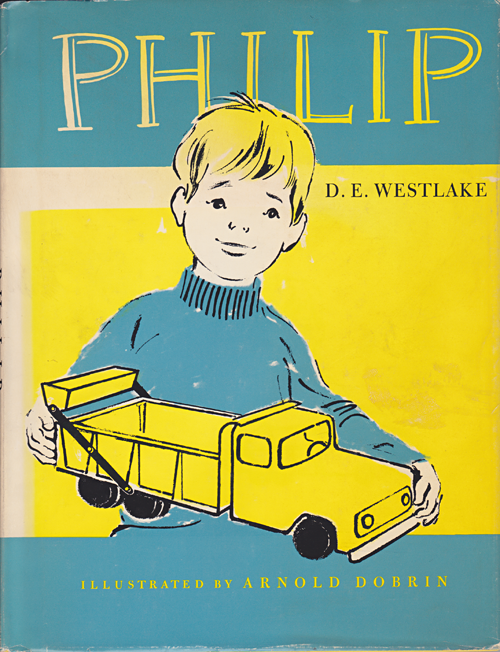 Philip graciously accepts this majestic largesse like the little prince he is (reminds me of a good friend’s younger son, also named Philip, only he’s being raised in Germany), and then is faced with a problem–he has a dump truck. Its only purpose is to scoop up dirt, carry it somewhere, and dump it. But there’s no dirt to be found in his immaculate home, and his parents can’t take him to the park (Central, of course) until the weekend. In the meantime, all he has to work with are toy building blocks. It’s not at all satisfactory. I had plenty of toys as a kid, and I (unlike Philip) grew up in the leafy suburbs of New Jersey, surrounded by lawns and gardens and trees, and no end of glorious dirt to track everywhere, and yes you may shed a tear for my poor mother now. I got very obsessed with beavers at one point, and I decided I wanted to build beaver dams in the sloping concrete rain gutter in front of our house. With my hands, of course–beavers don’t have trucks. They were simple affairs at first, just mud and grass clippings, but I got more sophisticated in my building methods over time, and crafted very authentic-looking miniature beaver dams, with sticks and rocks and anything else that seemed appropriate. I started to build twin dams like beavers often do, and I learned how to build them just before an overnight frost so the mud would be rock solid in the morning, but also just before a big rain, so there’d be a nice little river to dam, because otherwise what’s the point? The neighbors started to complain I was flooding the street, creating miniature lakes they had to avoid Well, what did they think beaver dams are for? The lakes proved the efficacy of my designs! My parents told me to stop with the damn dams already. Nobody appreciates a true visionary. I’m sure many of you have similar youthful tales of thwarted creativity to tell, so we can all identify with Philip’s frustration–but somehow we know, from our own past experiences, that there’s always a solution to these types of problems, if you look hard enough, while simultaneously failing to think hard enough about the potential pitfalls. This is part of the genius of childhood Buckminster Fuller was talking about, and exemplified so well in his adult life. I bet I could have invented the geodesic dome if my parents hadn’t suppressed me. Oh but the neighbors would complain! Beaver-hating philistines. Philip sees his window of opportunity–which happens to be in an actual window–with a window box full of dirt (DIRT! ), that is currently not hosting any flowers. It’s a bit confining for such a large truck, but he’ll work around that. Next thing he knows, his pretty blonde mother is scowling at him, saying Mr. Neep called up to complain somebody was dumping dirt on his nice clean uniform. Philip goes down to apologize, and Mr. Neep accepts in good grace. Mr. Neep is the adversary in this not terribly adversarial story (certainly much less so than Lentil). His uniform and size–and the absence of Philip’s father–make him the authority figure, and we know how Westlake feels about authority figures, particularly when they’re in uniform–but he’s actually a pretty nice guy, creaky knees and all. Westlake is deliberately toning down his own anti-authoritarian streak, presenting a fairly benign and understanding (but still very impressive) authority figure who can be reasoned with. Westlake knows his kids will be reading this, along with a lot of other people’s kids, and he doesn’t want to give them any subversive ideas that life will be giving them soon enough already, so what’s the rush? As the story continues, Philip can’t abandon his single-minded quest. He can’t wait until Sunday. There must be dirt somewhere! The sand in the lobby ashtray–no? The tree pit on the sidewalk outside–no? Shall he never find a place where he and his truck can make beautiful messes together? Always the looming uniformed figure of Mr. Neep intercedes between him and his goal. Mr. Neep finally talks to him (see above) and finds out what the problem is. He tells the doorman at the next building something, and he tells the next doorman, and etc. At first Philip thinks he’s just telling all the other doormen on the block how bad he’s been, and is rather downcast. But it turns out this is the doorman message service, and Mr. Neep (a most exceptional figure of authority in a Westlake story) has hit upon a solution to their mutual problem. Philip sees workmen coming down the block, from a nearby construction site, carrying tools, boards–and dirt! On his apartment terrace, they construct Philip a sort of sandbox, only with dirt from the excavation instead of sand. His crisis resolved, Philip sets about happily to work with his truck. His mother has no problem with all this dirt being brought into her home. Nor do the construction workers wolf whistle at her and make comments about her bodily parts. Well, you don’t expect realism from a children’s book. You don’t even want realism in a children’s book. Not that kind of realism, anyway. Maybe construction workers were more courteous and self-restrained back then. In the late 1960’s. Never mind. What you do want in a children’s book is a really fun exciting story, and that’s where Philip falls a bit short. Westlake, I think is not writing a book about his own boys, but rather an idealized look at what his own childhood might have been like if his parents had been a bit more prosperous–his own mother worked very hard to supplement the family income, his father did a lot of business travel. I’ve already mentioned elsewhere the ghastly story Westlake told about how his dad felt a heart attack coming on during one of those trips, checked into a cheap hotel, drank cheap liquor, and waited it out. So this, you might say, is to Westlake what Ah Wilderness! was to Eugene O’Neill–a wistful look at what might have been, a touched up photo of the author’s youth–only written at a small child’s level. The menacing policemen who arrested and interrogated college-age Westlake for stealing a microscope become a friendly helpful doorman. The mother who had to work her fingers to the bone, and probably had much less time for her son as a result, becomes a happy homemaker who approves of her son’s industry, even while expecting him to behave properly. The absence of the father is interesting, but he’s only absent during the days. He’s coming home to Philip every night, taking him to the park on Sundays, and certainly not in a fleabag hotel room, waiting to find out if he lives or not. Nothing is really wrong in Philip’s world. It’s perfect. It’s a bit too perfect. This is a children’s book written by a parent, from a parent’s perspective, and if there’s a message in it, it’s much more for the parents reading it to their kids than to the kids themselves. The kids just want a good story. The parents, Westlake thinks to himself (and at himself), need to be reminded that as annoying as the energy of their kids can be, as irritating as their endless curiosity and need to explore their world can become, they the parents need to remember what it was like–go back in their minds, and see it from the child’s perspective. Show a bit more patience, and look for ways to help the child be creative–and to let the children explore at least some of the world around them by themselves. Because once that time in your life is gone, you never get it back again. The passage I quoted in my review of Murder Among Children, about how older people tend to resent the energy and noise of the young, might well have derived from Westlake’s awareness of how impatient he was with his own children. As any parent will be, at times, certainly if he’s got a whole lot of books to write–and his marriage to their mother is falling apart at the seams. But I think the main message is to just let children alone sometimes, and only step in when needed. They need some unstructured time to seek their bliss, and make their mistakes. There’s a real problem with that nowadays, with so many one or two child families–many of today’s parents tend to ‘bubble-wrap’ their kids, schedule every waking moment, never allow any free time for the child to just be a child, to explore, to learn on his own–they do this out of understandable fear, but they often do a lot of damage in the process. Westlake isn’t reacting against that nascent trend back in 1967–but I doubt he’d have thought much of it later on. Then again, he’s certainly gone out of his way to remove every last trace of potential danger from Philip’s life (though Mr. Neep does threaten to spank Philip at one point–something no doorman would get away with now). He would have understood where those protective impulses come from. So to answer my own question, yeah, it’s a children’s book, and a pretty good one, but far from a great one–there’s a reason it was never reprinted, though it continues to be in a number of public libraries around the country, which I hope will not all end up selling it on ebay, because then kids (and their parents) will never be reading it anymore. It’s kind of nice to know the book is still out there, reaching the audience it was meant to reach. Even though most kids would much prefer Where the Wild Things Are. It sympathizes with the problems of the child, but is written too much from the perspective of a parent. It’s just a wee tad patronizing, I’d say–deadly to this kind of book, or indeed any interaction between child and adult. This particular field of literature was never going to be Westlake’s metier, and yet we can still see elements of the writer we know peeping out–Philip’s little misadventures have within them the seeds of a personality that, if not properly channeled, might well end up planning crimes, if only out of boredom. He doesn’t mean anyone any harm, but it’s just so much fun to figure out how to do things. To look at the world around you, and figure out what’s possible and what isn’t. You can go a lot of different ways with a personality like that–you can write crime novels–or you can steal microscopes. “Now you’re the door,” Philip would tell him, and shoot him. Well, that’s why children aren’t mainly allowed to write their own books. I bet they did anyway, when he wasn’t looking. Kids are natural anarchists. Which is fine. Until they grow up. PS: One last time, I will repeat my offer–anybody who posts in response to this review may, if he or she so desires, receive an email with a scanned version of Philip–cover to cover. Just include your email in the post, transcribed in such a way as to foil those nasty spambots. I’ll do the rest. My inner Neep would allow no less. Please send a scan of the book, thank you! alandaviddoane at gmail dot com. First, let me say that I haven’t seen a lot of real doormen in my life. That’s said, Mister Neep looks almost exactly like a Soviet cop (or ment, Russian word for cop). It’s barely a short story, where illustrations are more like ornament than the part of the narrative. I don’t really like illustrated stories, preferring comics. Dobrin’s illustrations weren’t ugly, though not particularly inspiring. Oh yeah, a lot cheaper than that–that’s a typical example of somebody just picking a pie in the sky number and waiting for somebody dumb enough to pay it. Doormen don’t usually wear caps anymore in New York (maybe at the fanciest hotels), but in the richer nabes, you still see some very impressive specimens. I actually know a doorman (now retired)–one of nature’s gentlemen, as the saying goes, and also one of the best birders I’ve ever met. The job calls for good social skills, and a fair bit of acuity. People really can develop almost familial relationships with their doormen. I heard of one who got too old to do his job, and couldn’t afford a comfortable retirement–and the people in his building went out of their way to make sure he was properly taken care of. They got him out of a nursing home he wasn’t happy in, and found him a nice little place to live. These weren’t really rich people, but they were prosperous–and I much agree with Bernard Shaw that there’s a difference. Westlake felt much the same way about it. I received my digital copy (once again, many thanks) and have read Philip, and I agree with your assessment above, for the most part. It’s a perfectly fine though not great children’s book. (You may have liked it a little more than I, but I didn’t have to go through the trouble of scanning in every page.) I think the McCloskey comparison is useful, not just for illustration styles, but for the gentle worlds with kind authority figures in which both traffic authors traffic (for Westlake, just this once). I was (and still am) a big fan of McCloskey’s Homer Price stories, which do a better job than Westlake of tapping into the child’s perspective on the world, and the grown-ups who inhabit it. Throughout his career, Westlake proved to be a genius at imagining himself into the skin of other people. I love the quick sketches he does of characters who enter the story only briefly (the guy with asthma in the money room in Backflash, e.g.). But I’m realizing now that with a couple of notable exceptions, he doesn’t have a lot lot of child characters. Was that a bridge too far? Or is it just that the world Westlake tended to return to (crime, for the most part) is chiefly populated by adults? I guess I mainly liked it because of the insights into Westlake it provides–it’s hardly one of his more self-revelatory works–can’t be–but because it’s such an unusual type of book for him to be writing, it provides us with some new information. It shows us what he can’t do. Yes, Westlake was great at imagining the way other people could see the world, but not so great with children–why? He’s pulling his punches there. He could never write a book like Golding’s Lord of the Flies. He is never going to harm a child (and by this I mean a sexually immature human) in his fiction. He can’t go there. He won’t. He won’t do much more than faintly suggest the possibility of this happening. He’s not being naive–he’s just drawing a line in the sand, and not crossing it. Not for any reason. This was actually a pretty strong taboo in crime fiction in general–probably much less so now, with all these books about serial killers and such. Remember how shocking it was that Parker would kill a 19 year old boy so casually? Never would have happened to a 12 year old boy. Stark wouldn’t allow Parker to be in a situation where he had to kill a child to stay free. The question will never be posed. Most he’ll do is hint at it, as he does in the book I’m reviewing right after Anarchaos. And it’s actually shocking that he’d even hint. That’s the good thing about drawing lines in the sand–when there are no lines, after a while, nothing is shocking anymore. And that’s a sad thing, isn’t it? But if you can’t fully involve children in a story, if they aren’t subject to the same general rules that apply to the adults, they can’t be treated as equals, and can’t be fully developed characters–so in most of the stories Westlake writes, child characters make no sense. They’re just a burden on the narrative. You can have a very interesting child character in a Dortmunder story like Jimmy the Kid, because hardly anyone ever dies in those, and Dortmunder himself never kills anybody. However, that’s hardly a realistically depicted child–he’s basically an adult in miniature. He’s Westlake’s idea of how he’d have liked to be as a boy. He’s another Philip, only this time he’s been put in a situation where he can behave much more mischievously, get away with a lot more, because he’s surrounded by crooks, albeit fairly harmless crooks. Write that as a children’s book, you’d have a much more enthusiastic child audience. Well, as Westlake cheerfully admitted, it’s just a retake on O. Henry’s The Ransom of Red Chief, only O. Henry’s child is much more believable–he’s not an adult in miniature at all. He’s a typical spoiled brat. The fantasy is not the way the kid behaves, but how the kidnappers never even consider doing him in. Though his parents clearly have, from time to time. Westlake took that story, and decided to make the kid highly atypical–more than the equal of most adults. It’s funny. I love that book. But he only succeeds in writing from a child’s perspective by radically altering that perspective–and making it very clear the boy is never in the slightest danger at any time. The kid in Home Alone is in more danger than Jimmy the Kid. Westlake wrote very well from the perspective of young adults–those are the children in his stories. And very bad things can happen to them. But only once they’ve gotten well past puberty. That puts them in the game. Small children are decidedly not in the game–they are off-limits. And when you think about it, this is very much a criminal’s perspective, or at least it used to be–think about the way hardened convicts tend to treat known child molesters in prison–think about Fritz Lang’s movie, M. It’s as if living in such a hardened violent world makes people want to believe in the myth of total innocence even more. But as we’ve seen too often in recent times, that’s a pretty fragile barrier to protect real children from real harm. The unimaginable is not, unfortunately, the least bit unbelievable. So I don’t blame a father of two for wanting to shield his kids not only from life, but from the kind of larger than life stories he told to support them. However, to write really well for that audience, you have to draw the lines a bit more creatively–as McCloskey knew how to do. These days, of course, those kids are probably playing ultraviolent videogames, so who ever knows where the lines are now? My apologies to all the people whose posts did not go through–some quirk of WordPress (which I never used before setting up this blog) sent you to moderator-land, and I wasn’t notified of your missives–just approved them all en masse. I’ll get to everybody. Just give me a bit of time. “But something was wrong. And Philip knew what it was. Isn’t that his voice, loud and clear? A preference for order and utility, for doing a job the way it’s supposed to be done? Clear sentences laying out a point with just the tiniest hint of underlying exasperation? Yeah, that’s very D.E.W. I suppose I should have done more quotes, but I do so many, and just once I wanted to get a review in under 3,000 words–and I didn’t quite make it, but I was close. That’s the nice thing about the comments section, though–all sorts of supplemental commentary can fit in here, and it doesn’t count towards the length of the review. Not as I see it, anyway. Just forwarded it to you, Shawna–and I took the liberty of editing your response, so that your unaltered email addy won’t be harvested by bots. Btw, since I’m responding, might as well say to anyone reading this that I’m bogged down in my latest review. Might take a few more days. Doesn’t help that I had surgery yesterday (nothing serious, but still, surgery). Keep checking in–I should have something soon. I think. Westlake has (had?) a sister, Virginia. She’s two and half years younger than DEW. Damn–she’s mentioned in his NY Times obit, and my eyes must have passed right over her name–which isn’t Westlake anymore. But there’s nothing about her in the online bios I’ve looked at. Not mentioned in the selections from his autobiography published in The Getaway Car. He never mentioned her in any interview or article I’ve read to date. And honestly, best as I can see, she’s not referenced in any obvious way in his fiction. Including this book. I’m just about to review another of his novels where the male protagonist is an only child living with his father. Though another character in the book is the sister of a man who was murdered–never close to him, but wanting all the same to avenge him. At no time have I ever claimed to be any kind of expert on him. What I know about him, I know mainly from reading his fiction. And brother/sister relationships of any significance are extremely rare in his fiction. You can learn a lot about a writer from reading what he or she wrote–but there’s also frequently a great deal they choose to leave out, for reasons of their own, which we can only guess at most of the time. Westlake definitely had a sister, though I don’t know if she’s still alive. He wrote about her a bit in some parts of his autobiography that I didn’t include in The Getaway Car; it doesn’t seem that they were ever particularly close. Thanks for clarifying that, Levi. Just bumping into the inevitable limitations faced when making guesses about somebody based on his fiction–a good system overall, but not without inherent limitations. When he wrote about siblings, they were usually brothers–like in 361, only the ill-fated Bill isn’t Ray’s brother by blood, and makes his exit early on. Ray is the cuckoo in the nest–did Westlake feel like that sometimes? Most of his heroes seem to have no siblings at all. Some protagonists may come from big Catholic families, but you don’t really meet the others, except perhaps the mother, who is a comical yet sympathetic figure–closest thing to a true family portrait is Brothers Keepers, where none of the brothers are related. Fathers can be important too–Westlake’s sense of indebtedness to his own, for getting him out of trouble. But when he writes about fathers, it’s usually based more on his own experiences as a dad. If you go to Westlake’s website, and read his brief autobiographical profile, he mentions Virginia. Whether or not he “felt” like an only child is, of course, another matter entirely! Touching on P.G. Wodehouse, as you’ve done on this blog, many Wodehouse heroes are only children, frequently orphaned, while Wodehouse himself was not. For his part, Wodehouse felt that a lead character who was ordered about by his parents was somewhat pathetic and thus not funny, while a character who was ordered about by his aunts and uncles was simply a sympathetic obliging fellow, and thus (at least potentially) funny. Perhaps at least some sort of influence on Westlake’s “nephew” characters? That’s an interesting observation about Wodehouse, to which I must add that Wodehouse himself was no orphan (though based on a cursory reading of his bio, he might as well have been). And at least a few of Westlake’s characters are. They get bossed around by all kinds of people–the comic ones–but not usually blood relatives. So far, we’ve seen four ‘nephews’–the first has a mother, but no father, and an aunt married to a gangster, and neither is much present in the story, though they both factor into it–the mother had the aunt get him his job to get him out of the house. The second has a nagging mother who he eventually just ups and leaves behind in New York, though not entirely because of the nagging, since there’s a pissed-off cop in the mix, and a stripper girlfriend he needs to patch things up with. The third seems to have no family at all. The fourth is living far from his place of origin, and his parents, and is therefore a defacto geographic orphan (as are many adoptive New Yorkers). An uncle he never met leaves him a ton of money, and then all these relations he hadn’t heard from in ages start hitting him up for money. Our next ‘nephew’ lives with his father–again, just one parent–it’s an affectionate enough relationship, but not really key to the story. I don’t think–not quite finished rereading it yet. I don’t have the complete story to every single book running around in my head at all times, you’ll be relieved to learn. I’d assume Wodehouse’s influence was largely stylistic, but it’s hard to say. I’d say with Westlake this tendency to put parents out of the picture in one way or another is about his obsession with identity–and part of learning who you are involves some measure of separation from the people who raised you. People who live out their whole lives under some kind of parental thumb are never going to figure themselves out completely. They’ll never grow up. Of course, if you come from a big enough family, your parents will never have that much time to spend on you specifically, which works just as well. Wodehouse wasn’t really concerned with any of that–some of his standalone characters do enter upon journeys of self-discovery, but the best-known among his creations are either fully self-actualized characters from early on–Psmith, Jeeves, Uncle Fred–or else perpetual children, like Bertie and Lord Emsworth. Either way, there’s no sense that part of one’s life journey is declaring independence from one’s family. I mean, a lot of these people are landed gentry, or have incomes left them by rich relations–it’s quite impossible for them to declare independence without also declaring bankruptcy. Done, Nora–the email header will say “Images from KIC Station”. That’s the optical scanner I used to copy the book before returning it. It makes very high quality scans, but they’re copy-protected–I can forward them, but not post them online. Cops, Feds, gangsters, armed robbers, professional killers, terrorists, no problem–but not doormen. Those guys are tough. . Exactly how Wodehouse felt about butlers. You can be damn sure Reginald Jeeves is never going to get any dirt on his uniform. Wodehouse may find ways to quietly snipe at authority, but never openly defies it. With the possible exception of Roderick Spode, who wasn’t in authority yet, and thankfully never was. Thanks to Eulalie. Good old Eulalie. Where is she now, I wonder? Oddly enough, the only other time he was credited as D.E. Westlake was on Come ti rapisco il pupo, the Italian film adaptation of Jimmy the Kid. I doubt the filmmakers were even aware of Philip, though. So many writers go the two initials and last name thing. The list is endless. P.G. Wodehouse, S.J. Perelman, T.S. Eliot–on and on and on. Westlake probably just wanted to see how it looked on a book cover. He obviously decided it wasn’t him. Could you please send me a copy? Would be greatly appreciated! Done (I think, let me know). Edited out your addy, as requested. Not sure why, but the email bounced back to me. Maybe a spam filter thing, wouldn’t know. Sorry, just read your messages… Would it be possible to try a different email adsress? nks1_germany1@web1.de (please remove the ‘1’s). Thank you so much in advance. I hope it will work this time. Tried it. Let me know.